Who was Looking Glass and why was this Native Indian chief famous? Summary: Looking Glass (1832 - 1877) was the war chief in the Nez Perce tribe under the leadership of Chief Joseph. Looking Glass fought against the white settlers who were confiscating Nez Perce tribal land. Chief Looking Glass opposed surrender and died on October 5, 1877 when a bullet struck him in the head. The following fact sheet contains interesting facts, background history and information about the life of Looking Glass and the events in history that led to his fame as a great Native American Indian leader. Looking Glass, was a Nez Perce war chief, during their time when Chief Joseph led the tribe against the United States Government for the occupation of their lands. 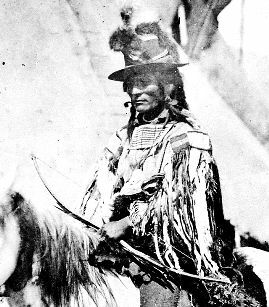 His first stint in battle was when he helped their tribe’s allies, the Mountain Crows, in defeating a war party launched by the Lakota Sioux along the Yellowstone River in 1874 where his qualities of bravery and leadership were displayed. His qualities and his performance in the battle against the Crow eventually led Chief Joseph to make him the war chief of the Nez Perce tribe. The same qualities may have been what pushed him to decide sign the treaty and accept the government’s offer of relocating his people in a small reserve located in Idaho. Looking Glass maintained a neutral stance and his tribe lived in peace in their settlement. Looking Glass believed that the United States government was going to leave them alone, but that was where they were mistaken. The threat to their peace happened when General Oliver Howard received reports that Looking Glass had attacked American settlements. In light of this report, General Howard gave Captain Whipple the task of taking Looking Glass into custody and to bring him to Mount Idaho. The company took Gatling guns for the mission. Captain Whipple’s plan was to surprise Looking Glass so, the troops travelled by night in the hope of surprising the Native Indian Americans. Captain Whipple's plan initially failed. His troops failed to surprise the group that same night because of the difficult trek over mountains made the journey time longer than anticipated. So, the troops were forced to halt their advance and took refuge at a crest of a hill, just a few distance away from Looking Glass’ camp. Looking Glass was made aware of the presence of the soldiers and sent a messenger who became the liaison between the two camps. Captain Whipple demanded to see the chief but Looking Glass believed that it was a trap, and refused to go to the enemy’s camp. Hostilities broke out and Looking Glass witnessed of the treacherous intentions of Whipple as the Gatling guns were aimed at his village. Looking Glass was outraged and joined Chief Joseph in the Nez Perce War (June - October 1877). His role was as war chief and his task was to lead the people on the tribe's doomed 1300-mile flight for freedom. He initially led the fleeing group of Nez Perce Indians and planned to regroup with their friends, the Mountain Crows, and arrange an attack on their opponents. The Native Indians stopped at Big Hole River and were attacked and routed by US troops led by Colonel John Gibbon. This battle caused Looking Glass to lose face among the tribesmen and for a few days he was excluded from the war councils. His initial plans of joining their allies failed when the Mountain Crows denied passage to their camp. This pushed them to join the Sioux instead at the Canadian border. The Nez Perce strategy of rapid movement and deception was due to the ideas of Looking Glass and by the time the tribe reached the Bear Paw Mountains, he was war chief again. It was Bear Paw Mountains that the Native Indians and US troops clashed again. They fought a five day battle against the troops of Colonel Miles. Chief Joseph favored surrender but Looking Glass strongly opposed the idea, favoring the short journey to Canada. Looking Glass was killed on October 5, 1877 when a bullet struck him in the head - the same day that Chief Joseph was forced to surrender.